The Palm Springs area has many outdoor activities for those people who are interested in that sort of thing. If you want to get away from the pool, shopping or playing golf, there is lots of hiking and biking that just about anyone can take part in. Palm Springs – hiking and biking activities are supported by volunteer organizations in the valley which many people benefit from. 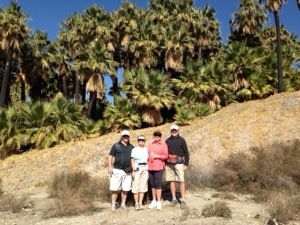 This picture was taken near the San Andreas fault line. An Oasis in the background of this picture is only here because of water that seeps up through the fault. It provides water for the palm trees. In the middle of the desert with nothing else around it is always amazing to see It is an area like this that seems to exist somehow in the dry desert. In this area, there are at least 4 oasis within a mile radius. There is dry desert in between all courtesy of the San Andreas fault that runs north to south just a few miles from Palm Springs. You cannot really see the fault. However there are signs and there are volunteers that are at another oasis with an information center. You can learn all about the fault, the oasis and the palm trees that grow in this area. When do go hiking, regardless of how far you plan to go, always tell someone where you plan to go. Always take water with you. Even a short hike can be difficult if you do not have adequate water with you in the dry hot desert. The water in this particular oasis is not drinkable due to the sulfur content. There are other minerals that exist in the water as well. Of course if you are biking within the city, there are lots of stores to stop at to get some water. Most coffee shops will provide glasses of water for free. However if you head out into the desert areas or in areas with lower population, make sure you have water with you. Dehydration can set in very quickly in the high temperatures.